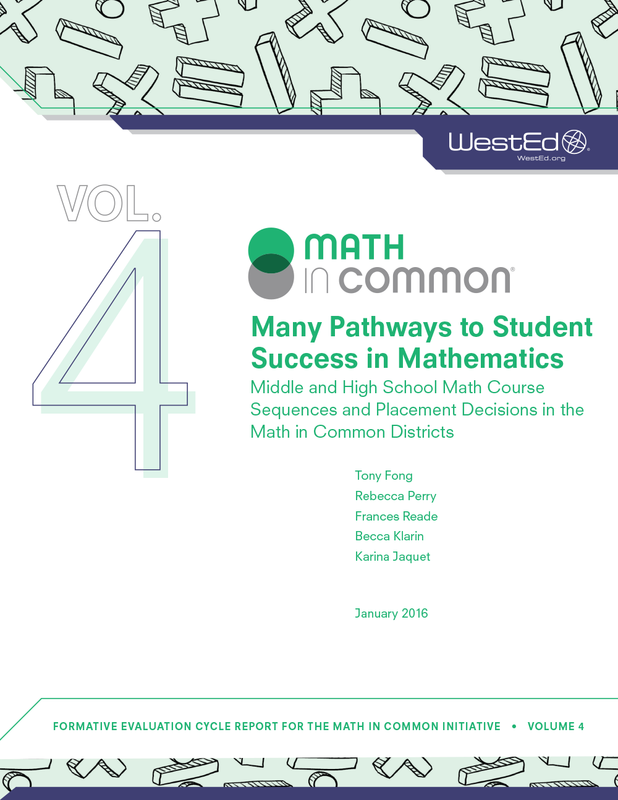 Math in Common® is a seven-year initiative (2013–20) funded by the S. D. Bechtel, Jr. Foundation supporting diverse California school districts as they implement the Common Core State Standards for Mathematics (CCSS-M) across grades K–8. Ten districts received Math in Common grants: Dinuba, Elk Grove, Garden Grove, Long Beach, Oakland, Oceanside, Sacramento City, San Francisco, Sanger, and Santa Ana. Collectively, these districts serve almost 300,000 K–8 schoolchildren and serve 9 percent more low-income students and 6 percent more English learner students than the average for schools statewide. Two districts, Garden Grove and Long Beach, concluded their grants in Summer 2018; the other districts continue in the initiative’s second phase ending in 2020. In addition to supporting each district’s unique strategy for implementing the standards, grants support all districts’ participation in a joint community of practice through which participants learn with and from each other and from experts in the field. 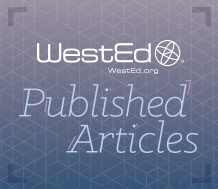 As explained in more detail below, WestEd’s role in working with this community of practice includes identifying, distilling, and sharing lessons learned about effective implementation. What Are Some Early Lessons About CCSS-M Implementation? Districts’ shift toward greater support for site-specific professional learning allows for tailored capacity-building based on school needs. Professional learning that occurs at a teacher’s school during or after the school day, that focuses on lessons, and that includes coaching as well as ongoing collaboration with peers is more likely to generate classroom change than one-time, centralized, and decontextualized trainings. Support that is embedded in the classroom can deepen teacher, coach, and principal understanding and mastery of math content and high-leverage instructional practices (e.g., use of high-cognitive-demand tasks to facilitate rigorous student academic discourse). Whether through coaching or through group observation, embedded support enables site-based educators to engage in shared reflection about instruction. By doing so, it serves as a lever for change at the classroom and school levels. Principals are vital instructional managers and agents for change. These school leaders are learning the key elements needed to support effective CCSS-M instruction and to build their own site-specific learning community focused on standards implementation. Site leader effectiveness is enhanced through professional learning supports that include developing their ability to recognize standards in classroom practice. Coaches are important drivers of success. They augment principals’ leadership at sites and support teachers in planning, modeling lessons, and co-teaching — while also helping establish expectations for results. Aligned curricula and instructional materials are essential but not sufficient for shifting instruction. Educators need supports and guidance to use these resources effectively. Subsequent Math in Common reports will continue to follow the progress of the initiative and participating districts. How Does Math in Common Work? Designed by California Education Partners, the Math in Common community of practice supports each member district in developing, updating, and executing its continuous improvement plan for implementation of the CCSS-M in grades K–8. Grounded in the latest research on mathematics education and education improvement, the initiative aims to build leadership capacity within each district and to support the broad Math in Common community of practice as its members discuss effective strategies, address common challenges, and exchange tools and lessons learned about standards implementation. Two-day convenings, held three times each year, engage four to eight key participants from each district, including assistant superintendents, directors of curriculum and instruction, district-level math staff, and school principals. The work is strengthened and sustained by the participation of a stable team from each district, with that team’s membership representing both top decision-making authority and boots-on-the-ground implementation experience. 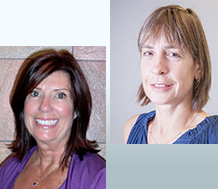 Workshops, led by expert presenters and the districts themselves, focus on common problems of practice (e.g., lesson study, principal training, strategies for improving high-quality student mathematical discourse, using state assessment data for improvement). Workshops frequently involve opportunities for districts to visit each other, with hosting districts showcasing their implementation activities. Summer professional development sessions are offered to develop the instructional leadership capacity of site-based educators, including principals, assistant principals, and mathematics coaching staff. These sessions share what has been learned through the cross-district community of practice with a broader audience from each district. Expert technical assistance is provided by request to each district leadership team to help with unique questions and challenges and to solve local problems of practice. Adopting a systems lens. The California math standards demand deep and broad shifts in classroom instruction. Math in Common districts have come to see that to enact these deep shifts, teachers need a coherent system of supports provided by many different people and structures in the district. Individually and together, members of the Math in Common community of practice often focus on mapping their district systems and structures (including professional development for teachers and principals; coaching programs; supports for special populations of students, such as English learners; and curriculum) and realigning them to work coherently toward a shared vision of effective mathematics education. Building a culture of learning and improvement. Efforts to strengthen systems tap into the talents of teachers, principals, and district administrators, building confidence and engagement in ongoing learning. In their improvement work, districts are testing theories of change, using data to inform decision-making, examining relationships between district programs and policies and student outcomes, and capturing and applying learning across schools. 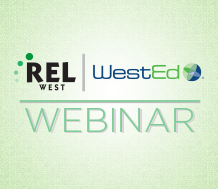 What Does WestEd Do for Math in Common? 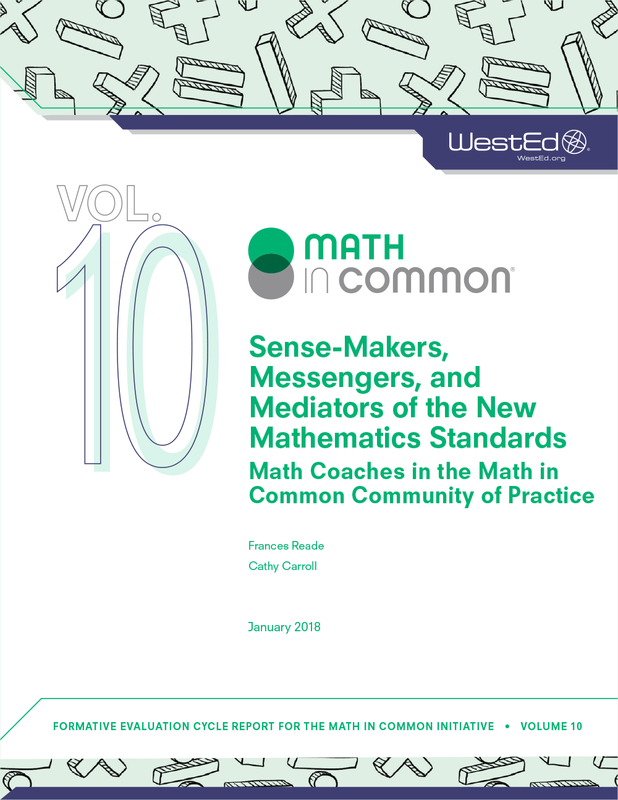 As evaluator, WestEd publishes frequent reports on particular challenges and trends observed in districts across the Math in Common community, giving participants and the wider field timely and relevant snapshots of standards implementation as it unfolds. WestEd also conducts research and provides formative feedback on the functioning of the community of practice as a whole. When the Math in Common community or its individual districts need help on a particular issue, WestEd connects them with experts in the agency who provide technical assistance in many forms: through consultations and ongoing improvement projects with districts; by hosting learning experiences and workshops at the convenings and as standalone sessions; and through close relationships that develop over time, allowing WestEd staff to serve as thought partners for the district teams. What Does California Education Partners Do for Math in Common? The Math in Common community of practice is one of Education Partners’ most mature collaborations and is, thus, a pioneer in the field of collaborative cross-district improvement. *Please contact other participating districts for more information. Students with disabilities are falling behind as districts work to implement new math standards. 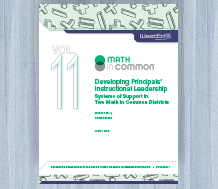 Learn how districts support principals to bring math to the forefront of their work. 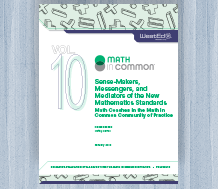 Offers eight recommendations for mathematics coaching support. The paper examines how a facilitator prepared to use and adapt video-based math professional development. 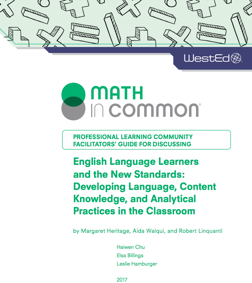 New resources are available for professional learning communities of math teachers and leaders to help plan lessons with ELs in mind. Nanette Seago and Rebecca Perry share classroom observation results that are part of a formative evaluation of Math in Common (MiC). 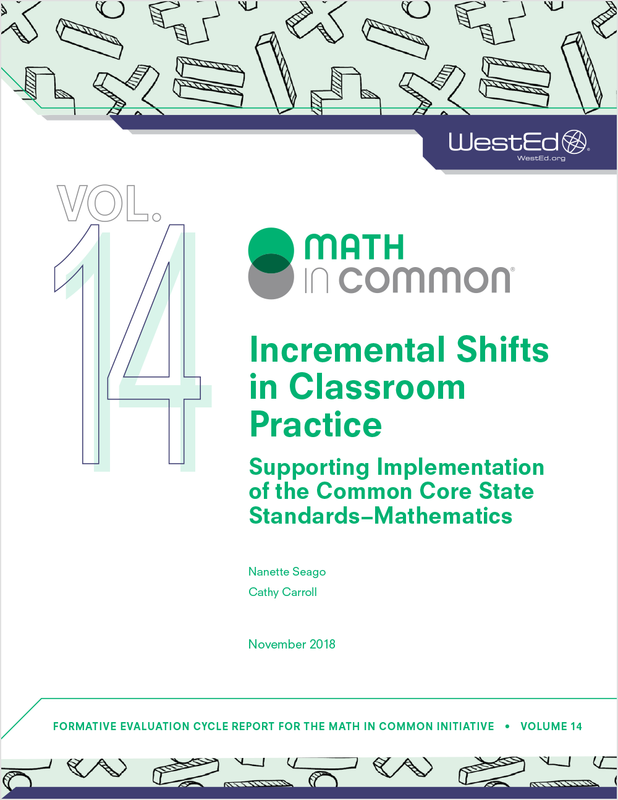 This report draws on qualitative data to present five cases describing shifts in classroom practice related to Common Core State Standards in Mathematics. 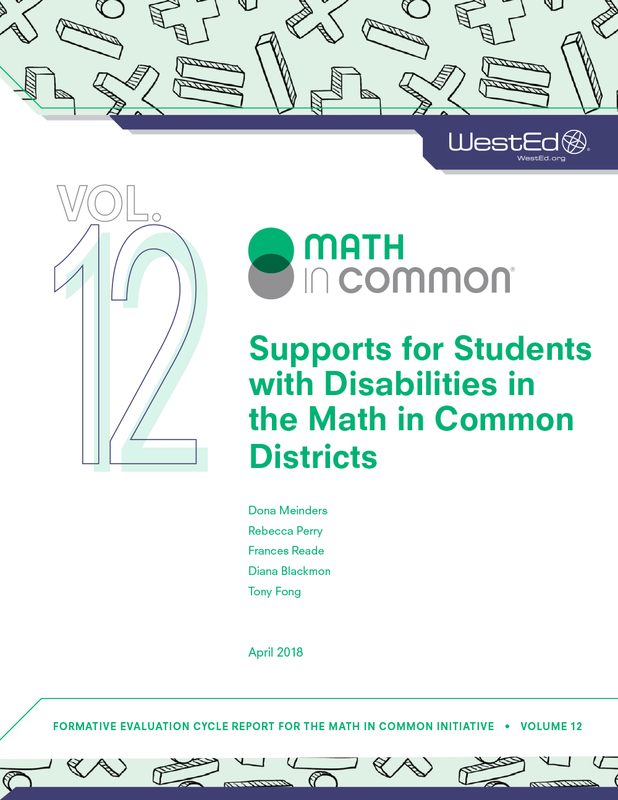 Learn how two school districts are successfully building supports for students with disabilities into all their work for math instructional improvement. 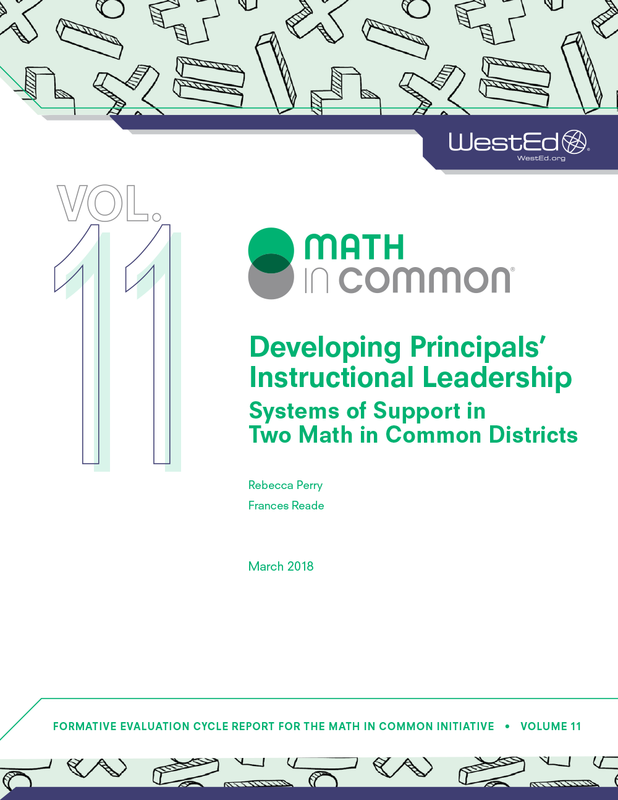 Learn about the ways districts are moving to systematically support principals to understand the instructional shifts required by the Common Core State Standards in Mathematics. 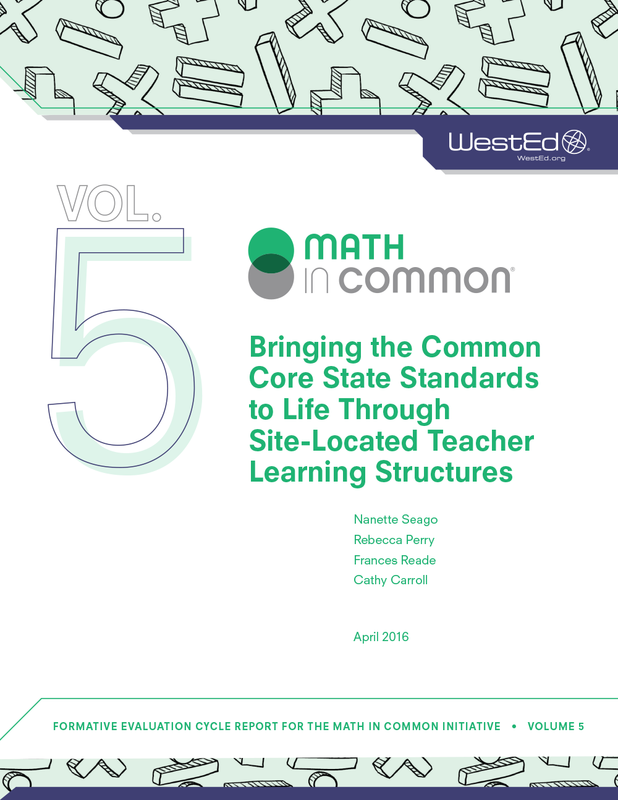 Learn how coaches are supporting math standards implementation in school districts. 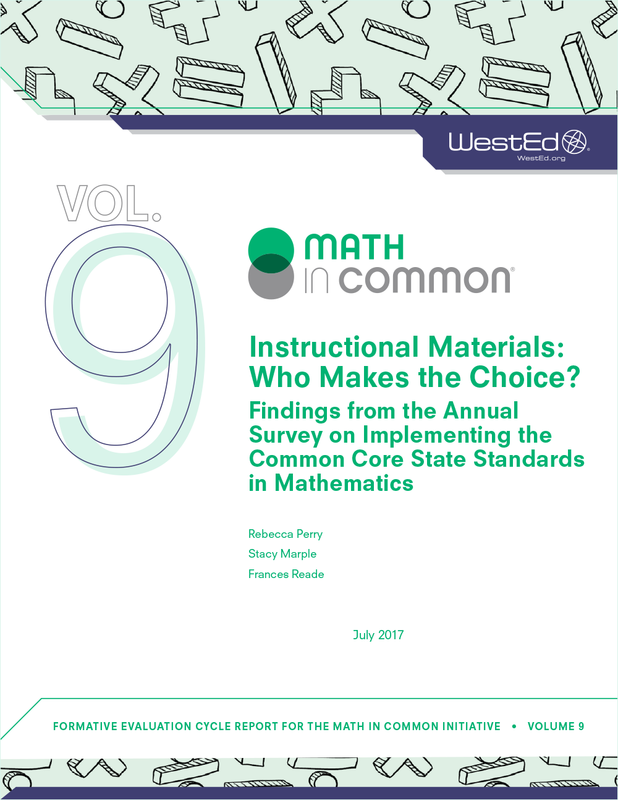 What are the key steps to consider, and pitfalls to avoid, when choosing curricula to teach Common Core math standards? 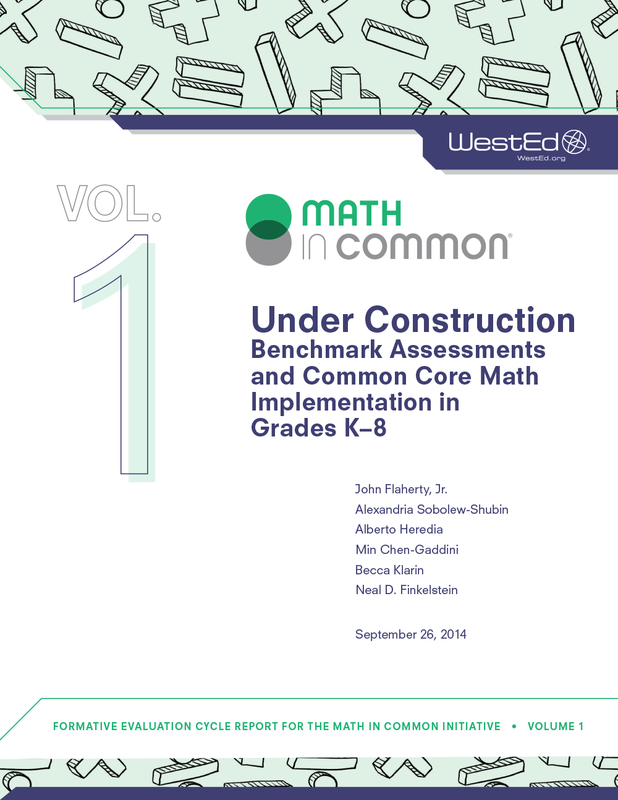 Why did one California school district drastically outperform nine others in meeting Common Core math standards? Find out in this report. 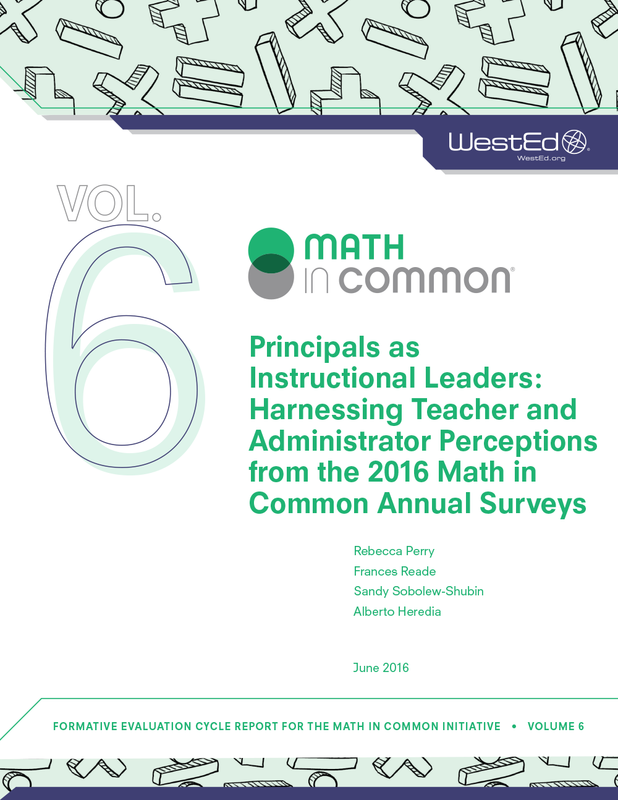 What are teacher and school and district administrator perceptions of the Common Core State Standards in Mathematics implementation process? Find out in this report. Learn how four school districts are designing and implementing site-based, lesson-focused teacher professional learning in the Common Core era. This report explores the decision-making of 10 California school districts implementing Common Core State Standards in Math. 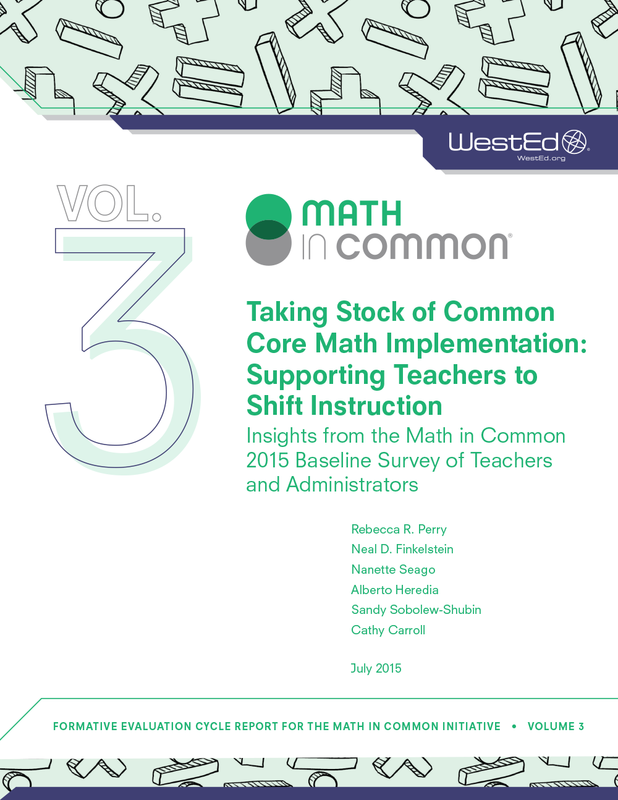 What do California educators think about their district's implementation of the Common Core math standards? Read the findings. 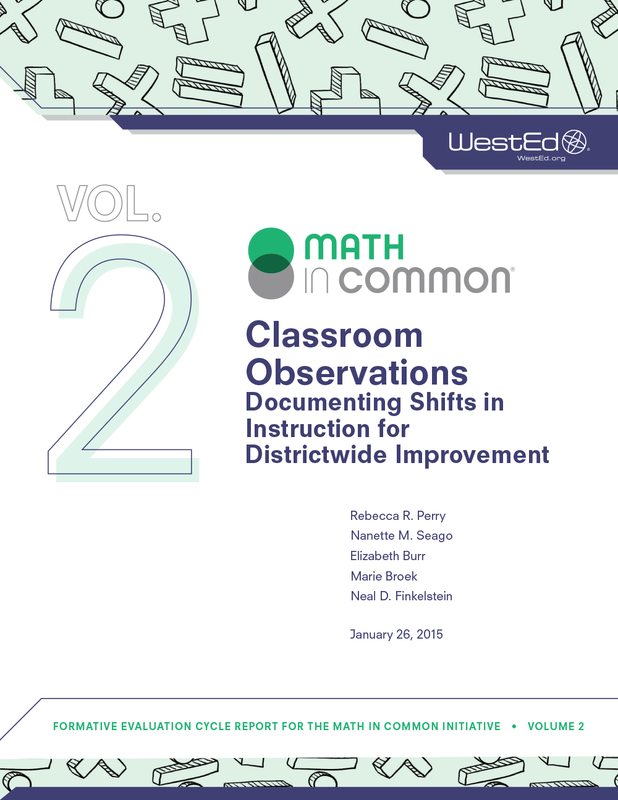 This research brief explores how best to select or develop and use classroom observation systems in order to document instructional shifts and inform district improvement efforts.